This recipe is by Maria Benardis, Founder of Greekalicious and author “My Greek Family Table” winner of the prestigious 2009 Gourmand World Cook Book Award – Best Mediterranean Cuisine Book. Recipe is from the Book “Cooking & Eating Wisdom for Better Health” (Balboa Press). This dish is my modern twist on the quintessentially Greek dish; dolmades. 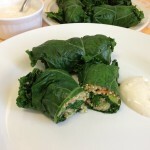 Instead of vine leaves I have used another ancient Greek ingredient; Kale. The ancient Greeks loved to stuff items of food and one of their favorites was to mash foods into a paste and to wrap it in leaves or breads. I believe that kale was one of these ingredients. I have also used quinoa instead of rice or bulgur as is the tradition. You could use cooked brown white or brown rice instead of quinoa. the stem begins. Fold the sides of the vine leaf over the filling. Then roll the leaf all the way up, starting at the stem end, to form a neat parcel. When you have finished making all the dolmades arrange them on a serving platter. Place all the ingredients for the yoghurt dipping sauce in a bowl and mix well. Place the dipping sauce on the side of the platter and serve.